The Auckland Premier Men’s cricket season kicks off on October 20, a couple of weeks later than last year. The late start negates the use of artificial wickets which allowed play to get underway in changeable spring weather, but were not seen as ideal for premier grade cricket. I caught up with Bill Walsh who will be captaining the Howick Pakuranga Cricket Club’s premier side The Alpacas again this year, and asked him what he views as the strategy to retaining the two-day competition prize, the Headley Howarth trophy. “The key to our success last year was the ability of everyone to contribute under pressure at some point during the course of the season to win games. We’ll be looking for more of the same this year”. The boys from the east enjoyed a stellar season in 2017/18. 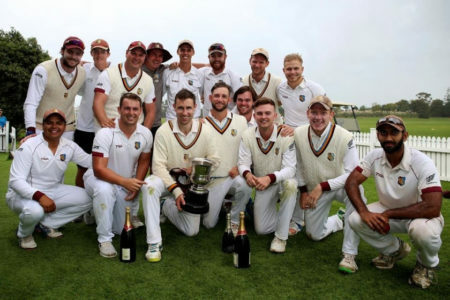 As well as winning the Hedley Howarth two day competition, they also and came fourth in the Jeff Crowe Cup 50 over competition, and first in their Twenty-Twenty group. There have been some changes in personnel. Last year’s coach Ben Williams has moved on, and is replaced by experienced campaigner Alan Hunt. On the player front, Brian Barnard has made the move across town from Cornwall, and should add plenty with his muscular hitting. Walsh is also hoping to have some of the club’s BlackCaps available early season. When coupled with Auckland Aces’ Danru Ferns and Jamie Brown and veteran all-rounder Donovan Grobbelaar, the side has a solid look to it. Blackcaps allrounder and long term HPCC servant Colin De Grandhomme has departed for Tauranga, something that Walsh says is “a big loss losing a great club man like Dutchy” but believes he will be “in his element” down in the Bay of Plenty sunshine. The clubhouse has also undergone some off-season changes. It is now boasting a new pro shop run by cricket retailer Freedom2play.co.nz who supply cricket and hockey apparel, uniforms and gear. The shop is located on the first floor of the clubrooms, and is open Tuesday – Friday (4pm – 8pm) and Saturday and Sunday (12 noon – 4pm).